Wayne Kingston died December 20, 1967. Son of Douglas and Dorothie (Tracy) Kingston. In addition to his parents, he is survived by two brothers, Barry and Todd and a sister Tracy. 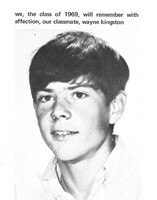 Wayne was a junior at Needham High School. Wayne's family, after his sudden and untimely death, created a scholarship in his name. The first recipient was in 1969. And I was that recipient. It meant an awful lot to me. I had not been close to Wayne but we knew each other over the years as we grew up. I remember the day I was told that he had gone into Newton-Wellesley Hospital for surgery and died. Many years later I ran into his brother and we had a great time together remembering Wayne. He was the first in our class to pass. I have remembered him repeatedly over the years. I also remember what I did with the modest scholarship payment. I used it to help pay my way across the country in the summer of 1969, where I ended up in Berkeley and Height Ashbury , my eyes wide open to what was breaking out in the last summer of love. Wayne’s brother said that is exactly how Wayne would have liked that scholarship money to be spent.